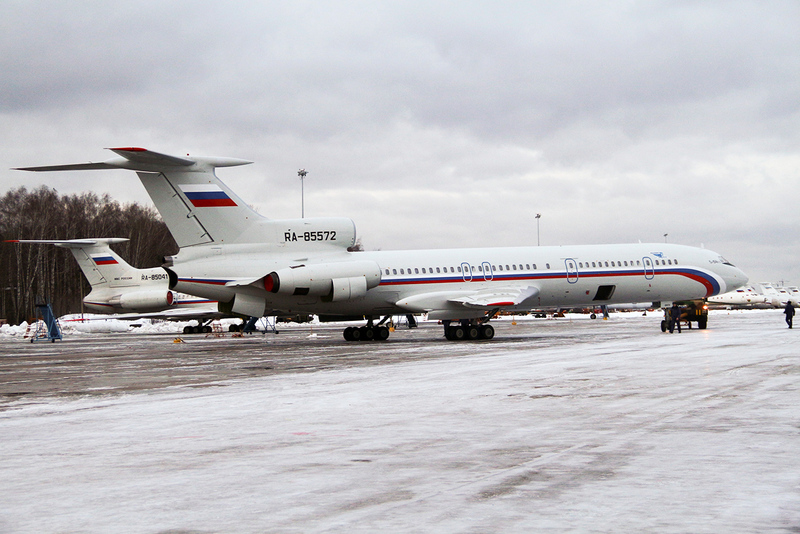 Tu-154 plane with registration number RA-85572, foreground, at Chkalovsky military airport near Moscow, Russia. A Russian plane with 92 people aboard, including a well-known military band, crashed into the Black Sea on its way to Syria on Dec. 25, 2016. Russia’s Defense Minister ordered the replacement of old civilian planes used by the country's armed forces. But it’s still not clear which other planes will take their place. After the Tu-154 tragedy on Dec. 25 over the Black Sea, which resulted in the death of 92 people, the Russian Defense Ministry decided to decommission the old Tu-154, Tu-134 and Il-62M planes, reported (in Russian) Kommersant business daily. "Currently, there are talks with the industry to find the best solution," reported Kommersant, adding the United Aircraft Corporation is working closely with the Defense Ministry to modernize the air fleet. Tu-124s, and the new SSJ 100s, might be chosen to replace the older planes. The Russian Defense Ministry will pay to upgrade the air fleet without exceeding its current budget. Pavel Bulat, director of the Mechanics and Energy Systems international laboratory at the University of Informational Technologies, said the replacement of short-haul Defense Ministry planes is in full swing. Every year the military receives four to six An-148 planes, but the program will end within five months. "I doubt, however, that the SSJ 100 and Tu-214 will be used by the defense ministry," said Bulat. The former plane requires an excellent airport that allows bulky civilian planes to land at the speed of a jet fighter. It would be necessary to modernize the airports where they’ll be based." Bulat believes using the Tu-124 is more realistic because, "this plane is made in small numbers - two or three a year - while the Defense Ministry has about 20 Tu-154 planes of various ages. This means that in the near future it won’t be possible to quickly replace the Tu-154, and the military will continue to fly on it." The tragedy on Dec. 25 was the main reason for the modernization of the Russian Defense Ministry’s civilian air fleet. The Tu-154 plane crashed a mile from the Black Sea coast during a flight to Syria. The tragedy occurred as the plane was gaining speed and altitude. The crew did not transmit a distress signal. Among the 92 passengers were 68 musicians from the Alexandrov Military Ensemble, nine journalists and eight members of the crew.